Food on Friday: Broccoli & Brussels Sprouts is collecting all and any dishes featuring either broccoli or Brussels sprouts – both are said to be very good for you – but I have to admit I find them a bit boring and am always looking for ways to jazz them up a bit! To add your dish just pop the name of the dish (and your blog name/name if you like) into the first Mr Linky box and paste the url for your post about it into the second one. I'll be pinning the dishes to this Pinboard so that should make it easier for you to check out the other dishes. My Ma's recipe - #5 Anna Sultana's Tuscan Sun Chicken - is an easy meal to make and it has broccoli. "Regrets are a waste of time. They're the past crippling you in the present." Don't have regrets. Have Tuscan Sun Chicken. How to make frozen brussels sprouts taste good. Fast and frugal! Hi Carole! These Brussels sprouts have turned haters into lovers! I am a recent convert to brussels sprouts and yes there is a S! Thank you Carole! I brought Caramelized Brussels Sprouts with Strawberries and Broccoli Carrot Fritters!!! Hi Carole my recipe this week is a lovely fillets of wild red salmon pan fried and sandwiched between 2 layers of puff pastry seved with carrots and broccoli. A lovely combination. Look just trust me on the anchovies... it's the most awesome pasta dish! Hi Carole, Happy Friday. Great idea for a link up. I know I have other Brussel Sprout recipes because I love them, but my Spaghetti with Broccoli Pesto is a great way to get veggies into your food without really trying. My contribution: Brussels sprouts, Elisson-style... roasted, with capers. I loves me some Brussels sprouts! Yummm I love broccoli and brussels sprouts. I snuck some broccoli into my Mac n' Cheese! Thank you, Carole. We eat a lot of broccoli! I have a great broccoli recipe which sadly I haven't blogged. In fact - no broc or BS recipes on my blog at all so I'm not joining in this week. At least I have some new material to work with! HI Carole - no posts for me this week. 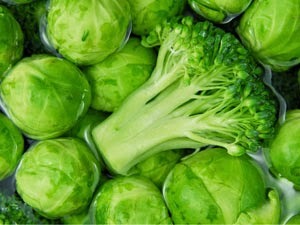 I can't stand broccoli or brussels sprouts (the Devil's Sprout). I can see plenty love them though! Try #61 if you are feeding brussel sprouts haters. Haven't found anyone yet who doesn't like this recipe. LOVE this link up, Brussels Sprouts have become one of my favorite veggies!! Love this week's topic! I've included one broccoli & one brussel sprout recipe, something a bit different. I'm not sure how healthy our Brussels sprouts recipe is - we cook ours in ghee! I'm coming to you after fixing my octogenarian parents' wifi and time machine back up device, which is a ridiculously mean feat for someone as tech-un-savvy as I am. I've got a bunch of broccoli recipes (pun totally intended) but my family's favorite has got to be Rice Casserole. In addition I've got soups, pizzas, and mains.